Avalanche rescue dog Rio looks across Lake Dillon during pre-season rescue training in mid-October. 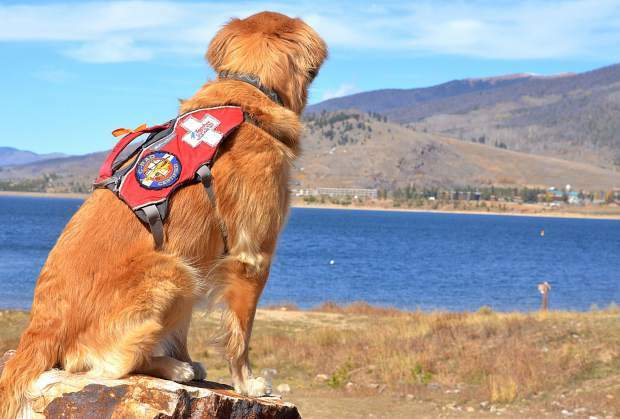 The 5-year-old golden retriever has been on patrol since a puppy and started training at 4 months old with his handler, ski patroller Matt Northfleet. 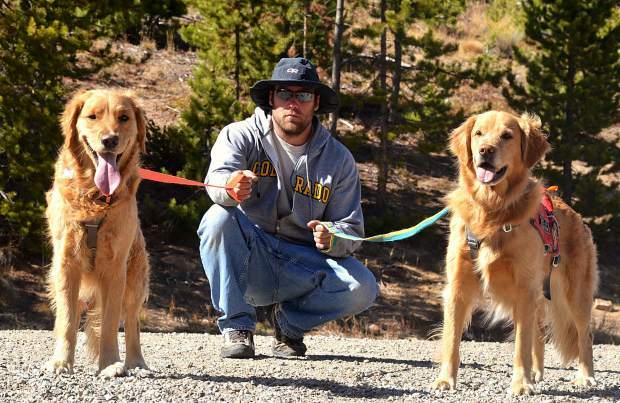 Copper ski patroller Chris Gray with his dog, 2-year-old golden retreiver Mason (left), and 5-year-old golden Rio. Gray has owned Mason since he was a puppy and selected him just for avy work. "Puppy selection is a bug part of our porgram," he said. Copper ski patroller Nick Slaton with Recco, a 7-year-old golden retreiver that's been on patrol since she was a puppy. The dog works year-round on search-and-rescue operations across the state, which keeps her sharp for avalanche rescue work come wintertime. Avy dog Rio looks on as 2-year-old Max, a black labrador, practices recovery drills with his trainer during pre-season training hosted by the Colorado Rapid Avalanche Deployment program in mid-October. Handlers say it's important for dogs to train year-round to stay fresh with search-and-rescue skills. Avy dog Max, from Arapahoe Basin Ski Patrol, pulls A-Basin patroller Kyle Hagadorn from a faux-snow pit during dryland training hosted by the Colorado Rapid Avalanche Deployment program in mid-October. "There is no electronic device that is better than the dogs," Hagadorn said. 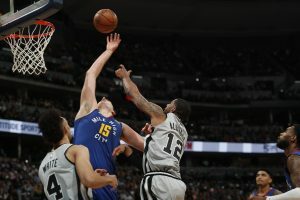 "We rely on their noses to do that." 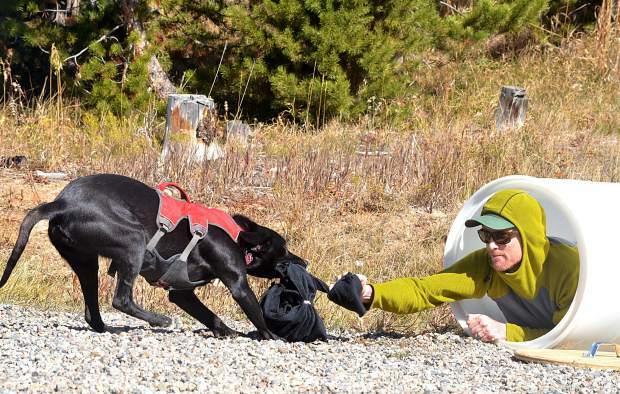 SUMMIT COUNTY — Saving your life is an avalanche rescue dog’s favorite game in the world. Seriously. 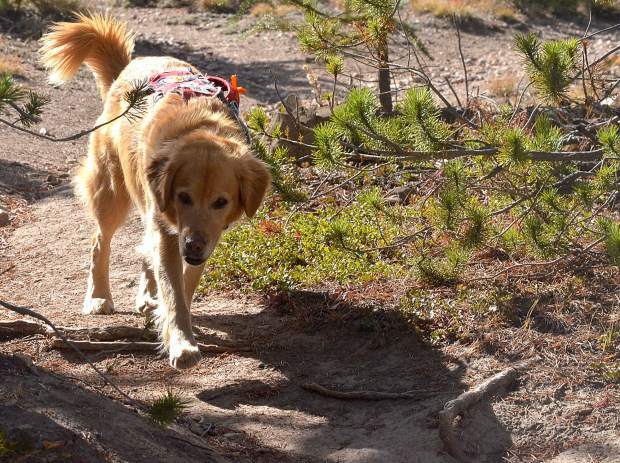 For the adorable Labradors, golden retrievers and mutts on ski patrols in Summit County, a search-and-rescue operation for avalanche victims is one big, rewarding game of hide-and-seek. Their handlers know the very serious consequences and dangers of tracking in the wake of a slide, but the dogs are simply happy to help. “This is still the most fun thing they get to do. (They) play hide-and-seek with a person,” said John Reller, a part-time patroller at Copper Mountain Resort who owns two veteran avy dogs, 7-year-old golden Recco and 7-year-old golden mix Race. Just like their humans — ski patrollers privately own almost all avy dogs — the animals get rusty if they don’t refresh their skills, and the vast majority of ski patrol dogs aren’t active with search-and-rescue work during the summer. And, just like their humans, the best remedy for flabby ski muscles is a preseason workout. In mid-October, the Colorado Rapid Avalanche Deployment program — a statewide task force created by Flight For Life Colorado — did exactly that. 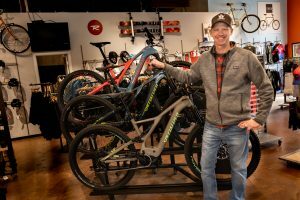 C-RAD invited 26 avy dogs and 46 humans from across the Rockies to town for three days of warm, dry, snowless training between Frisco and Windy Point Campground. That’s right — avy dogs don’t need snow to shake off the cobwebs. 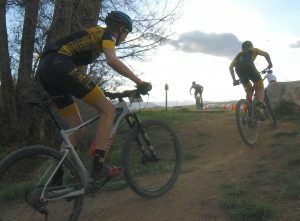 This preseason training concept for C-RAD is relatively new. 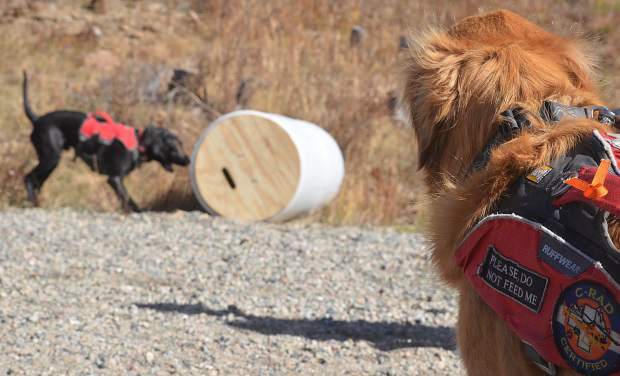 It’s only the second autumn that Reller and organizers have brought together an entire network of dogs, handlers and snow safety technicians, with groups from Breckenridge, Keystone, Loveland, Vail, Aspen, Telluride and more in Colorado, plus two dogs from Nevada. All avy dogs are required to go through Flight For Life helicopter training, but organizers wanted to get more out of the annual event. They expanded to three days, with one day of avy training and two days of search-and-rescue drills (aka hide-and-seek) in the woods. But why snow techs if there was no snow? 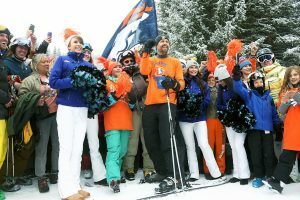 It might be a game, but it takes a perceptive handler to play along, and ski patrollers like Nick Slaton of Copper know they can learn plenty from a veteran dog. Recco and her counterpart, Race, are the year-round patrollers of the avy dog world. Come summertime, they switch from avy work to water and wilderness rescue. Recco assisted on two potential drownings this summer and Slaton believes it has made Recco a better rescue dog. Again, any training is just as good for the humans as it is for the animals. In one session, the handlers simulated an avalanche victim by hiding in a corrugated tube, similar to winter training with snow pits. The dogs practiced finding the handler and alerting another handler to the “buried” human. 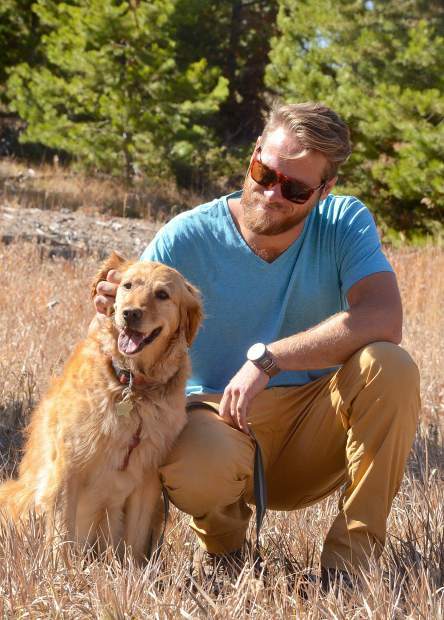 Some were veterans, like Race and Rio, a 5-year-old golden from Arapahoe Basin Ski Area, and others were relatively new, like 2-year-old black Labrador Max, also from A-Basin. There was plenty of excited barking during the practice rescues, and then the group of five or six handlers took 15 minutes to talk about what worked, what didn’t and what they can keep working on between now and the first snowfall.